The human-dominated geological epoch known as the Anthropocene probably began around the year 1610, with an unusual drop in atmospheric carbon dioxide and the irreversible exchange of species between the New and Old Worlds, according to new research published today in Nature. Previous epochs began and ended due to factors including meteorite strikes, sustained volcanic eruptions and the shifting of the continents. Human actions are now changing the planet, but are we really a geological force of nature driving Earth into a new epoch that will last millions of years? Scientists at UCL have concluded that humans have become a geological power and suggest that human actions have produced a new geological epoch. Defining an epoch requires two main criteria to be met. Long-lasting changes to the Earth must be documented. Scientists must also pinpoint and date a global environmental change that has been captured in natural material, such as rocks, ancient ice or sediment from the ocean floor. Such a marker - like the chemical signature left by the meteorite strike that wiped out the dinosaurs - is called a golden spike. The study authors systematically compared the major environmental impacts of human activity over the past 50,000 years against these two formal requirements. Just two dates met the criteria: 1610, when the collision of the New and Old Worlds a century earlier was first felt globally; and 1964, associated with the fallout from nuclear weapons tests. The researchers conclude that 1610 is the stronger candidate. The scientists say the 1492 arrival of Europeans in the Americas, and subsequent global trade, moved species to new continents and oceans, resulting in a global re-ordering of life on Earth. This rapid, repeated, cross-ocean exchange of species is without precedent in Earth's history. They argue that the joining of the two hemispheres is an unambiguous event after which the impacts of human activity became global and set Earth on a new trajectory. The first fossil pollen of maize, a Latin American species, appears in marine sediment in Europe in 1600, becoming common over subsequent centuries. This irreversible exchange of species satisfies the first criteria for dating an epoch - long-term changes to Earth. The researchers also found a golden spike that can be dated to the same time: a pronounced dip in atmospheric carbon dioxide centred on 1610 and captured in Antarctic ice-core records. The drop occurred as a direct result of the arrival of Europeans in the Americas. Colonisation of the New World led to the deaths of about 50 million indigenous people, most within a few decades of the 16th century due to smallpox. The abrupt near-cessation of farming across the continent and the subsequent re-growth of Latin American forests and other vegetation removed enough carbon dioxide from the atmosphere to produce a drop in CO2. Thus, the second requirement of a golden spike marker is met. The researchers have named the 1610 dip in carbon dioxide the 'Orbis Spike'. They chose the Latin word for 'world' because this golden spike was caused by once-disconnected peoples becoming globally linked. Lead author, Dr Simon Lewis (UCL Geography and University of Leeds), said: "In a hundred thousand years scientists will look at the environmental record and know something remarkable happened in the second half of the second millennium. They will be in no doubt that these global changes to Earth were caused by their own species. Today we can say when those changes began and why. The Anthropocene probably began when species jumped continents, starting when the Old World met the New. We humans are now a geological power in our own right - as Earth-changing as a meteorite strike." He added: "Historically, the collision of the Old and New Worlds marks the beginning of the modern world. 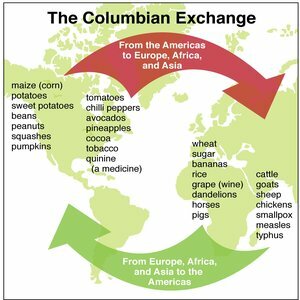 Many historians regard agricultural imports into Europe from the vast new lands of the Americas, alongside the availability of coal, as the two essential precursors of the Industrial Revolution, which in turn unleashed further waves of global environmental changes. Geologically, this boundary also marks Earth's last globally synchronous cool moment before the onset of the long-term global warmth of the Anthropocene." The authors also considered the merits of dating the Anthropocene to 1964, which saw a peak in radioactive fallout following nuclear weapons testing. This marker is seen in many geological deposits, and by the 1960s human impact on the Earth was large. However, the researchers note that while nuclear war could dramatically alter Earth, so far it has not. While the fallout from nuclear bomb tests is a very good marker, the testing of nuclear weapons has not been - in geological terms - an Earth-changing event. The beginning of the Industrial Revolution, in the late 18th century, has most commonly been suggested as the start of the Anthropocene. This linked a clear turning point in human history, and the rise of atmospheric carbon dioxide from fossil fuel use is a long-term global environmental change of critical importance. However, the researchers did not find a golden spike at that time because most effects were local, while the global exponential rise in carbon dioxide was too smooth an increase to form a precisely dated marker. The authors' new paper ends by highlighting some implications of formally defining the Anthropocene. Co-author, geologist Professor Mark Maslin (UCL Geography) said: "A more wide-spread recognition that human actions are driving far-reaching changes to the life-supporting infrastructure of Earth will have implications for our philosophical, social, economic and political views of our environment. But we should not despair, because the power that humans wield is unlike any other force of nature, it is reflexive and therefore can be used, withdrawn or modified. The first stage of solving our damaging relationship with our environment is recognising it." An official decision on whether to formally recognise the Anthropocene, including when it began, will be initiated by a recommendation of the Anthropocene Working Group of the Subcommission of Quaternary Stratigraphy, due in 2016.